There are many roach traps to choose from. Choosing the wrong one(s) will cost you both wasted time and money. Losing money is pretty bad, but losing precious time is the worst when you’re dealing with cockroaches. Those who make this critical mistake and/or use them incorrectly end up giving their invaders the time needed to explode into almost uncontrollable numbers. This list of the best traps will tell you exactly which ones to buy and how to use them correctly, so you can make sure they don’t get that chance. I encourage you to read about each trap before deciding which one to use. If you’d rather just get the trap right away, here’s the list of cockroach traps I recommend in the order of best to worst. Catch Master Insect Traps. My favorite trap for catching roaches. Low cost per trap, able to use your own bait, and flexible. Check for the best prices from here, or jump straight to the detailed review below. Victor Insect Magnet. Works well, you can use your own bait, come’s pre-baited and just as flexible. Only downside is they cost a little more per trap. Read more about it below. Buy it from here. Roach Motel by Black Flag. Effective, but limited because you can’t place your own baits in the trap. Nice plastic casing, but cost per trap is high compared to the other two. Search for deals from here. You’ve probably heard of the first one on this list, Roach Motel. The box states, “Roaches check in…but they don’t check out” and that is completely true. Any cockroach that makes its way in doesn’t make its way out. This trap uses a strong adhesive that will hold on to any that makes contact with it. It doesn’t use any poison, or pesticide. They simply get stuck in there until they die (well, they don’t exactly get out after they die either, but I think you get the point). What makes them “check in”? The adhesive is mixed with a secret attractant that is irresistible to most roaches. There’s nothing to be concerned about the attractant though. The smell is barely noticeable unless you stick your nose in it. Even then, it smells kind of like maple syrup, so it’s not a foul odor or anything like that. The adhesive will stay effective for many months as long as it doesn’t get too full from dead bugs, or it doesn’t get covered in dust and dirt. Dust and dirt isn’t much of a problem because the trap is enclosed with only one opening. The attractant will be effective for about 2-4 months. If they aren’t full of dead bugs before the attractant wears out, you’ll want to replace them for the best results. Roach Motels are fairly small traps, so they don’t cover a lot of area. The key to using them is in greater numbers, so buy them in bulk, like this case pack of 12, to save some money. You’ll want one in each high traffic area, but preferably two. If you’re using two, face the opening in opposite directions. 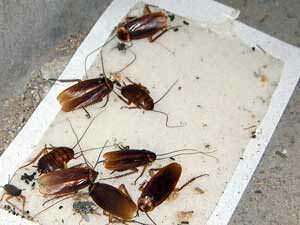 Roach motels are effective tools, but they will not be able to eradicate the entire roach population by themselves. You must use it with a contact killer like DemonWP (cypermethrin). I recommend spraying DemonWP with a sprayer as the first line of defense and strategically placing a large number of Roach Motels as the second line of defense. Buy them in bulk from Amazon to save more money. If you buy them in individual packs, they can add up a bit. Any strays that makes its way past your first line of defense will get taken out by the traps. Because of their small size and no poisons, they are also great in the kitchen. You can place them next to small appliances and cupboards/cabinets (where roaches like to hide). If you have young children or pets, you’ll want to keep these away from them though. They’re very sticky and cane be hard to remove completely. The second trap in our list is the Victor M256 Insect Magnet. It’s the same concept as the Roach Motel above; with a few twists that I think really helps. Victor Insect Magnet traps are also poison and pesticide free. The trap lures in roaches with pheromones and traps them there with a strong adhesive. The patented pheromone is so good that one user left a negative review on Amazon. The complaint was the pheromone worked too well. It worked so well that it attracted roaches from other apartment units. While it was bad for this particular user, it’s a great reassurance for us. It tells us that it works! and the Roach Motel is in the box design. The Roach Motel only has only entry point; which I think kind of limits the catch rate somewhat. The Victor M256 has 3 entry points. There is one large opening on one end of the box. There is a smaller opening on the side that also serves as a side viewing window (to see how many you’ve caught). It also has a corner opening on the top that is perfect for corners. The top opening is also great when placed directly next to a small appliance. You should replace them every 2-3 months, or if it gets full of dead roaches, dust, or dirt. Multiple openings do allow more dust and dirt to contaminate the adhesive, but I think it’s a worthwhile trade off for a higher catch rate. These are fairly cheap too, so replacing them more often is still very affordable. Just like the Roach Motels, these Victor Roach Magnets are a little small in size. You’ll want to use at least a couple of these in high traffic areas. You can usually buy a box of 12 for less on Amazon, so grabbing at least 2 boxes and spreading them out is a good idea. The manufacturer recommends that you move the traps if it doesn’t catch anything within 72 hours. I second this recommendation because location is everything when it comes to using these glue traps. Placing them where you see them the most is important because if you place them in places where roaches don’t frequent, you’ll just be wasting money and giving them more chances to reproduce. As with Roach Motels, you shouldn’t use these as your only line of defense against roaches. You’ll want to use them as a second line of defense and spray a contact killer like DemonWP as your first line of defense. If you don’t can’t, or don’t want to use synthetic pesticides then use something like diatomaceous earth instead. The first two options work great, but this one, the Catchmaster 288i Insect Trap and Monitor, is my personal favorite. It’s actually a preferred choice of many professional exterminators. It doesn’t use any pesticide. It uses adhesive just like the other two and is pre-baited with molasses to lure them in. The best thing about this cockroach trap in particular is the cost. It’s way cheaper compared to the other two, as well many others. possible. Here’s the good part, each monitor is about the same size as the Roach Motel and the Victor Insect Magnet. Doing the math (36 x 3), you get 108 traps. You may be thinking why would you ever need 108 traps. I’ll tell you honestly right now that numbers matter in the war against cockroaches. You could be dealing with hundreds, or you could be dealing with thousands. The more traps you have, the more you’ll be able to kill. Besides, you don’t have to use them all right away. Use some and replace them as needed. The box design on this trap allows for even more entry points. Each trap, when broken down into smaller monitor sizes has 4 openings; one on each side. If you choose to use them without breaking them down, each trap has a total of 8 openings. More entry points mean more chances to catch roaches. One thing that makes these different (and better if you ask me) is the fact that you can place these traps upside down. For example, you can place them right under the kitchen sink, or under cabinets. This is possible because each trap has a built in adhesive backing strip. The other two don’t have this, so you have to place them on to of a surface. The glue lasts up to over a year; although the same rules of dust, dirt and dead bugs still apply. Replace them if they get full. This will be my third time repeating this, but it’s really that important when using glue traps. You need to use these with a contact killer. My first choice would be a synthetic pesticide like DemonWP that will stay effective for over a month. If you can’t, or don’t want to use a synthetic pesticide then use a hand duster with the all-natural alternative, diatomaceous earth. You can read about it in more detail here. Traps work well, but they can make for bad combinations with a few things. The problem lies in how traps work; they keep them stuck in place until the roaches die. Most roaches won’t be able to escape these adhesive traps. When used with contact killers like mentioned above, that is fine. 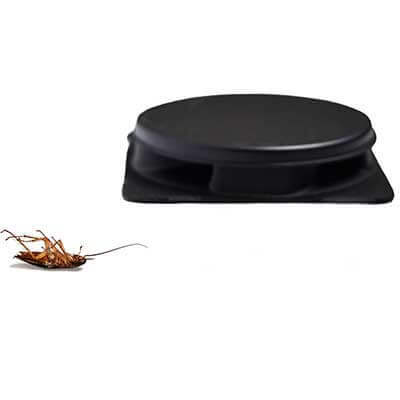 However, when used with Advion roach baits (or roach baits in general) and other solutions that depends on cockroaches feeding on “poison”, traps stop them from working properly. That’s because once they’re stuck in place, they can return to the nest and poison other roaches. Whichever one you decide to use, all three of these are great choices. Just remember that they must not be used as your only line of defense. Make sure you are using a contact killer as well and these roach traps will get you results faster. I have read your recommendations re: “elimination of cockroaches” and want to “Thank You!! !” I BELIEVE YOU MADE MENTION THAT YOU PREFER 1) DEMON WP WITH SPRAYER — WHERE CAN I BUY THIS WITH SPRAYER??? 2) CATCHMASTER 288i INSECT TRAP & MONITOR — (OVER BLACK FLAG MOTEL & VICTOR M 256 INSECT MAGNET) AND WHERE CAN I BUY THE CATCHMASTER 288I TRAP??? ARE THESE CHOICES BETTER THAN ADVION GEL BAIT??? I appreciate your feedback on this matter — THANKS, AGAIN!!! The easiest place to get them is from Amazon.com. If you click on the links under each items, it will take you directly the the product page on Amazon, where you can easily buy it and have it shipped right to your door. Would a little diatomaceous earth with peanut butter work? I have DE on hand. Let me tell you, it wiped out a bad flea infestation! Will the DE make it back to the nest and kill others as well? Are these products safe if you have a cat in the house?